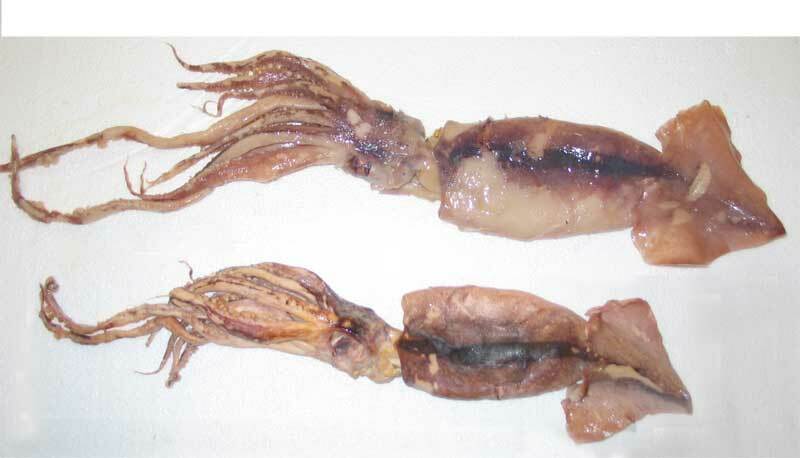 Many people have asked us why the colossal squid specimen was so much smaller than anticipated when we thawed it. Initial reports suggested that the specimen was considerably larger than the final measurement of 4.2 metres in total length. We suspected that the specimen had shrunk (rather than the size being greatly exaggerated!). In order to test our theory we purchased several fresh arrow squid from a local fish shop and subjected them to a series of treatments to see if we could shrink them, and by how much. We think that the year-long storage in the freezer before we thawed the colossal squid allowed it to dessicate (“freezer burn”) and contributed to its shrinkage before it was even preserved in formalin. Assuming the amount of shrinkage was similar for the fresh arrow squids and the colossal squid in the freezer and then formalin, the original length would have been well over 6 metres!